What are the top misconceptions about visiting Brooklyn? Some people think/hope they can see a wide range of neighborhoods and sites in two or three hours. I do like wide-ranging tour routes and can manage a fast pace, but visitors must recognize that Brooklyn is very large, and it can take a while to travel between different neighborhoods or landmarks. This FAQ was too short (ha), so I made a list about misconceptions. What do you recommend for a first tour? As a good introduction to the history and feel of Brooklyn, I recommend Brooklyn 101 or Brooklyn 202. For more of the buzz, consider Williamsburg or Greenpoint (and, if you have more time, combine them). I can modify all tours. Some clients even say things like, "Let's spend five hours seeing interesting things." That's fun. Why do you prefer that potential clients initially use email rather than call? I provide personal service, so I'd rather not play phone tag. Readers of this web site should learn much about potential tours, which makes the process efficient. (In other words, you should know not to request "a tour of Brooklyn" but rather a specific one from my list, or an adaptation.) If you want a same-day tour, please try both phone and email, because the email form asks several questions that moves the process along. Some people book many months in advance, some at the last minute. In general, a few weeks' notice is wise, especially in the busier months (Spring and Fall). In the winter, I can often be flexible about timing, so we can wait to check the weather. Your tours sound pretty fast-paced. We're not. Will you slow down? Faster-paced tours can let us see more in a relatively short time period. For private clients, I of course will conform to your pace. Are bathrooms available on the tours? For private tours, we can usually find a bathroom, though sometimes you have to buy something at a cafe. For large group tours, I always discuss a bathroom stop with the tour planners. Some public tours include a bathroom stop, some don't. In any case, I strongly encourage attendees to prepare. They're not geared to children, though many energetic and curious kids/teens have enjoyed them. Remember, tours typically last at least 2.5 hours. Only very rarely have people brought small children or babies; please check with me. Why can't we reserve a specific time via an immediate online link? As a one-guide operation, my availability varies. I promise to respond promptly. Why "New York Like a Native" if you focus on Brooklyn? Well, I've branched out beyond Brooklyn, to Manhattan and Queens. Most importantly, "like a native" implies a New Yorker's sense of pace and place. From the start, I figured the Manhattan market was well-served by guides--though I've long led tours in Manhattan's Lower East Side, where I have decades of experience and which links to Williamsburg. In 2014, I launched my first Queens tour, in Long Island City, which is a cousin of sorts to Greenpoint and Williamsburg. In 2016, I added my second Queens tour, in Sunnyside & LIC East. More neighborhoods are coming. How many neighborhoods are there? The map above shows Brooklyn's breadth. See home page for neighborhoods where I lead tours. Each year or two, I expand my repertoire. In 2017, I debuted Red Hook. Can you lead a tour outside the neighborhoods you list? Sure. It may require some extra research. For example, though I don't lead walking tours in East Flatbush, Brownsville, East New York, Mill Basin, and Sheepshead Bay, I have guided groups on tours that included stops in those neighborhoods. Other neighborhoods where I developed a custom tour (Bay Ridge, Bensonhurst, etc.) have now joined my repertoire. If we book a 2.5-hour tour, can we extend it? Can you combine a Jewish neighborhood and a trendy neighborhood? Yes, but not in 2.5 hours, unless you're focusing only on Williamsburg. Otherwise, I recommend the 2.5-hour Brooklyn 101 tour with either an extension to Jewish Crown Heights (+ 1 hour) within the tour or, at the end, an extension to Jewish Williamsburg (+1.5 hours). We can even do both. Can you do an "ethnic neighborhoods" tour? Yes, but please note... there are many ethnic groups in Brooklyn, including Polish (Greenpoint), Middle Eastern (Bay Ridge; also Atlantic Avenue shopping district), African-American (Bedford-Stuyvesant especially), West Indian (Crown Heights, Flatbush, etc. ), Chinese (Sunset Park, Bensonhurst), Russian/former Soviet Union (Brighton Beach, Sheepshead Bay, etc. ), Italian (pieces of Carroll Gardens/Williamsburg, Bensonhurst, Dyker Heights), Pakistani/Bangladeshi (Kensington), Turkish (Midwood), Orthodox/Hasidic Jewish (multiple neighborhoods), Mexican (ditto), Sephardic Jewish (Kings Highway). Many of these neighborhoods are not the focus of my listed tours, because they don't necessarily contain the most notable history, architecture, or institutions. But they're still interesting. It's cold or wet or really hot. How can we do a tour but avoid the elements? My tours--other than vehicle tours--are mostly outdoors. That said, I can try to build in some stops (public buildings, cafes, shops) to avoid the weather. If you supply a vehicle, I'm happy to join you. Tours in Spanish? Multilingual tours? Sorry, but as a typical American; I'm not multilingual. I don't lead tours en español--well, I have led a few tours in enthusiastic but broken Spanish, but I don't profess fluency. You can find multilingual guides via the Guides Association of New York, of which I'm a member. I've led several tours working with translators. Well, the Dyker Heights Holiday Lights tour can only be done in late November/December/early January. The Flatbush tour is offered year-round, but is especially fun just before Halloween. Fort Greene and Clinton Hill also offers pre-Halloween fun. As the leaves change color in the fall, great options include Brooklyn 101, Brooklyn 202, and Park Slope. 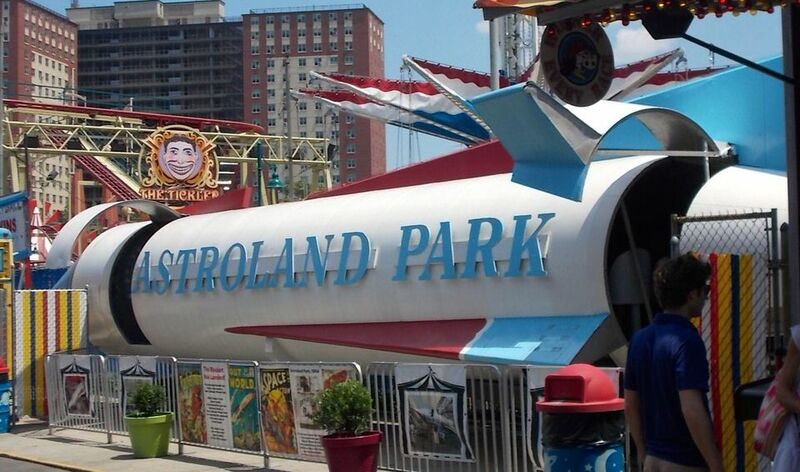 While Coney Island can be visited year-round, it's best to go when the rides are running: late May through early September, with weekend activity sometimes in October. Sorry, these tours are for humans, not pets. Please don't--your guide is allergic. If you must, please step a good distance away. Do tours start on time? I am on time/early 99% of the time. I'll wait for private clients, of course. While I appreciate clients who are prompt, please note that some tour starting places are chosen for convenience near subway stops, and may not be the best place to linger. So if you're planning to be very early, please consult with me first, or get a cup of coffee. Public group tours start on time; why disadvantage those who are prompt?. But we typically don't leave the starting place for 10-15 minutes. So latecomers to public tours may miss some history/background, but won't miss the group. Is public transportation included in the price? Food? No. I assume that people already have MetroCards. (I can give you advice on buying/using them.) Food is extra. I can recommend places for a snack, meal, or dessert. (A meal adds time to a tour, of course.) I can also point you to a restaurant or food hall after the tour. Can we find a taxi after the tour? Usually. If there is no yellow cab, new(ish) green, outer-borough taxis have meters and accept street hails. No need to confirm price. The more traditional option is to call for a car service (confirm price beforehand). Now there's Uber/Lyft/Juno. We'd like a tour in a car or bus--do you drive? Guiding takes concentration, so another driver is required. Can a tour work if a family member drives? Sure, but remember that legal parking is often difficult, so the driver may have to remain while others exit. If you'd like everyone to get out several times and walk, I recommend that one person focuses on driving. Can you lead a food tour? Yes--and no. Some companies offer food tours in which large (or small) groups only aim to sample. I generally prefer to highlight neighborhoods, but can certainly incorporate food. Dessert and/or ice cream work especially well. We only eat kosher--are kosher meals available on private tours? In certain neighborhoods, sure: Williamsburg, Crown Heights, Midwood, Borough Park. Can you lead a family reunion tour, or a 70th birthday tour, involving custom research? Of course. Those can be very satisfying. I usually must add a research fee, depending on the list of locations you have relevant to family history, as I develop a custom route. Can we visit DUMBO or walk the Brooklyn Bridge before the Brooklyn 101 or 202 tours? You can, though those locations are at the end in my typical sequence. That said, I'm happy to lead the tour "backwards." Alternatively, the Brooklyn Museum and/or Brooklyn Botanic Garden are great to visit before these tours, as they're near the starting point. We're hoping to save money. Why can't you just charge $25-$35/person? Why can't you add us to someone else's tour? I understand the rationale, but... that's never worked out logistically. What are the pros and cons of a one-guide operation? I'm not always available, so larger companies may be more flexible. But New York Like A Native clients always get me as the guide. What are some unusual tours you've led? One very energetic guy wanted to see as many neighborhoods as possible in five hours by foot and public transit, since he was moving to Brooklyn and looking for a place to live. A woman from Australia eager to learn about her ancestor's career building houses in Brooklyn pushed me to create a custom tour in Bedford-Stuyvesant and Bushwick. A Brooklyn native returning after decades requested three consecutive days of tours to reintroduce himself to the borough. A writer working on a novel sought to learn the contours and details of Greenpoint. A photographer from Spain aimed to see as much as possible in five hours, so we traversed Fort Greene, Clinton Hill, Bedford-Stuyvesant, and Bushwick. A school with new teachers wanted to better understand Bedford-Stuyvesant and Crown Heights. An extended family reunion traversed the borough by bus to see several neighborhoods, all vastly changed, where the patriarch grew up. For an 80th birthday tour, we visited old family haunts (and synagogue) in Bensonhurst, then skipped to the Lower East Side to understand the previous generation. A Brooklyn native returned to see his old apartment and schools, which just happened to be blocks away from my home. A homebuilder from the Midwest was interested in Brooklyn rowhouse details, aiming to incorporate them in a new development. A woman wanted a gift for her boyfriend, so I developed a tour that included her neighborhood. A very energetic couple booked a full day, so we spent nearly 9 hours (with a lunch stop, etc.) combining Brooklyn 202 with Williamsburg. 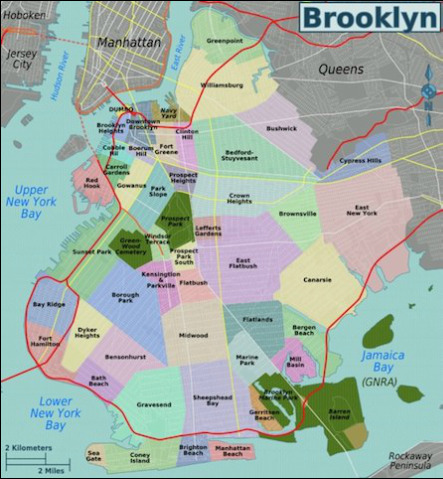 Do you really have an "encyclopedic knowledge" of Brooklyn? What's a brownstone? How do we get a look at brownstone interiors? A brownstone is a row house clad in brown sandstone, popular in 19th century Brooklyn. "Brownstone Brooklyn" is an umbrella term for row-house neighborhoods built in the 19th and early 20th centuries, including limestone and brick buildings. Brownstone Brooklyn neighborhood organizations offer house tours in spring and fall. The Park Slope Civic Council offers its tour the Sunday after Mother's Day. I volunteered for the Park Slope House Tour for some 15 years. Do you offer tours of matzo factories? Well, not officially. Until mid-2015, we could go by Streit's on the Lower East Side and take a peek. (Alas, no more.) But it may be possible to make an impromptu visit during a Brooklyn tour, only in the pre-Passover season, of course. What about tours of TV/movie locations, including Spike Lee's Brooklyn locations or sites in the HBO show "Girls"? Not really--though I can stop at a couple of places. A full tour requires a bus (which means a large group). Try On Location Tours. What about a literary tour of Brooklyn? Literary locations can range far afield. If you wonder where writers like Jhumpa Lahiri and Jonathan Safran Foer and Paul Auster live or have lived, we go there (neighborhoods, not houses). Please recognize that most "Brooklyn writers" are "writers who live in Brooklyn," not "writers about Brooklyn," as Colson Whitehead wrote. How about a hip-hop tour? Can you lead a tour of the Brooklyn Navy Yard? No. That's the specialty of Turnstile Tours. Are gift certificates available for public tours? Private tours? Not for public tours; I lead them too irregularly. I can create a gift certificate for a private tour. Can you offer advice on planning our overall visit: transportation, restaurants, hotels? Sure, though please hire me first for a tour! You may want to try other sources, such as TripAdvisor and Yelp. Here's one warning about renting unofficial units. Are there any scams we should avoid on visiting New York City? Yes. Please check out these tips, from the Guides Association of NYC, regarding fake monks, CD sellers, Battery Park ticket sellers, and Ground Zero street sellers. Do you accept barter payments? Not typically, but I'd consider it. What do you have to trade? Is Brooklyn safe? Is the subway safe? Are your tours safe? Most places where tourists go are quite safe, and crime has been decreasing. (Nothing criminal has happened to me in my 25+ years here.) But it's impossible to generalize about such a large place. The subway is often full of people, even late at night. Still, this is a city; visitors should be vigilant at night and on lightly populated streets, and avoid confrontations on the subway. Do note that some neighborhoods are safer than others, and some parts of neighborhoods safer than other parts. Also recognize that some gentrifying magnets are not without crime--I'm thinking Franklin Avenue in Crown Heights. Do check SpotCrime for some granular crime data (but consider the time of such crimes). Also see this historic homicide map, which does not necessarily account for improvements in safety and policing, but does give a sense of Brooklyn's more troubled areas. Nothing untoward has happened on my tours, other than fatigue and a bit of dehydration. So rest up, bring water, and wear comfortable walking shoes. Please note: you appear less vulnerable if you 1) walk with a sense of purpose 2) don't wear "New York" t-shirts that peg you as a tourist 3) don't flaunt cameras/jewelry/cash/iPhones in crowds, including the subway, 4) don't leave your wallet visible in your back pocket 5) don't isolate yourself with headphones/earbuds/texting. Also, don't walk down a crowded street 2/3/4 abreast. That annoys us. Also, keep track of your public space on the subway--you don't want to encroach on the wrong (crazy/angry) person. That sounds a little tough.... Are New Yorkers/you rude? You seem a little bossy? I think we're blunt. We mean well, but we tend not to dilly-dally. To be a good tour guide, you have to be somewhat bossy. Are the people who go on your tours locals or tourists? It's a mix. Some are Brooklynites or Manhattanites, or former New Yorkers. Others come from the metro area, other parts of the United States, or abroad. (I get a good number of Australians, it turns out.) Some are visiting friends and family; some want to see more of NYC; some are moving to Brooklyn. A growing number stay at hotels or guest houses in Brooklyn. I'm a former private tour client. Can you give some quick advice on my next visit, though I don't need another tour? Sure. I'm happy to provide such follow-up service to clients. Email is strongly preferred. Can you answer my random questions about Brooklyn? I might, but please try first on your own, at least if you haven't previously hired me for a tour. If it takes some research, I might ask for a modest fee. Where can I buy some cool Brooklyn t-shirts? Try Roxy's Tee Parlour. Also try the Transit Museum store. Will *you* hire me? How do I become a tour guide anyway? Sorry, no--this is a one-guide operation. Guides must pass the city licensing exam. Will donate a tour to our charity event? Will you lead a tour for our class/group for free? Sorry, no free tours. But I can be flexible on rates for some educational/nonprofit groups. We'd like a guide but you're not available. Who to contact? Try Eliot Niles at Brooklyn Attitude or ﻿Reva Cooper at HeartOfNYCulture.﻿ For in-depth tours of Manhattan, try Joyce Gold History Tours. You can also see listings at the Guides Association of NYC and Explore Brooklyn. Who built your web site? What website builder did you use? I built it all myself: design, text, and photographs. Using the Weebly web site builder made things easier (unsolicited endorsement, but if you sign up with this link you get 10% off and I get a $10 credit). This FAQ is quite long. Are you always this long-winded?